Christine Costiff and Gill O’Connor battled against the heat and the hills at the North Downs 30k on Sunday. Costiff finished in 3hrs:18m:21s and O’Connor in 3hrs:34m:00s. Andrew Noble and Shelly Blake travelled to Iceland for the Suzuki Midnight Half Marathon. Andrew Noble finished 16th overall in a time of 1hr:24m:56s whilst Shelly Blake finished in 2hrs:57m:21s. Closer to home Becky Macey set a new personal best at the Harry Hawkes 10 miler crossing the line in 1hr:13m:17s. Tomasz Latala powered home to victory for A&D RRC in the Podplus Ashford Summer Series 10k on Friday night in a time of 37m:19s. Gill O’Connor was 1st lady home in 46m:36s (9th). Meanwhile, Dan Green made it a clean sweep winning the 5k event for A&D in a time of 17m:54s. He was followed by Rob Barton who set a new personal best of 18m:45s (4th). Paul Moses crossed the line in 20m:08s (5th) and Christine Costiff was 1st lady home in 22m:16s (6th). Shaun Snowwolf also completed the course in 27m:03s (11th). Jon Pearce and Tomasz Latala made it an Ashford & District 1,2 at Ashford Parkrun on Saturday with Pearce recording a time of 17m:33s (1st) and Latala 18m:09s (2nd). Scott Lynch finished in the top 10 with a time of 20m:05s (9th) and Paul Moses finished in 20m:42s (11th). Rob Carpenter crossed the line in 22m:06s (24th), Elodie Paviot was the 1st lady home for the club in 22m:14s (28th), James Chapman in 22m:45s (36th), Don Dewar 23m:29s (47th) and Aaron Homewood in 23m:56s. Shaun Snowwolf set a new personal best of 25m:43s followed by John Fidge in 25m:45s and Rachel Jenkins in 33m:01s. Meanwhile, around the country Mark Boorer completed the Eastbourne Parkrun in 25m:56s. 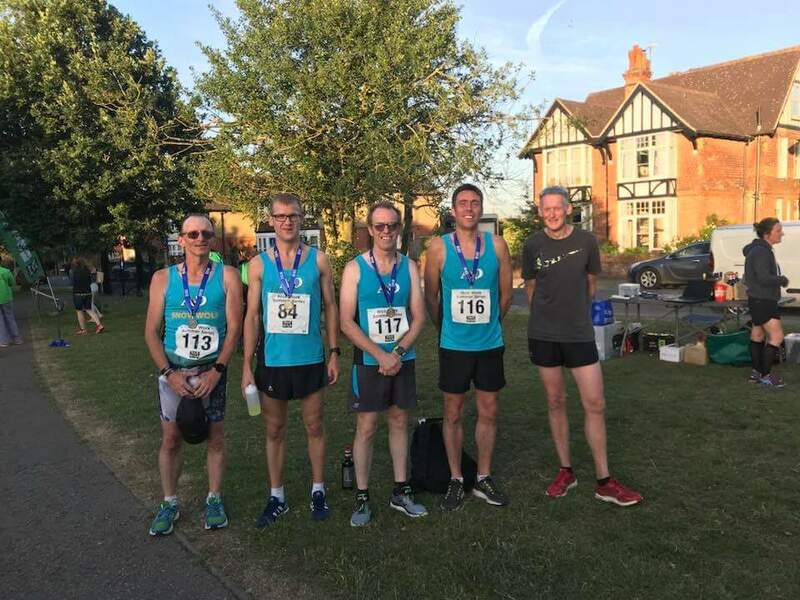 A&D trio Will Whittington (23m:52s), Trevor Sparkes (24m:02s) and Emma Jenkins (33m:13s) ran Pegwell Bay Parkrun and Christine Costiff ran the Peasmarsh Midsummer 4 miler in 24m:31s. Dan Green, Rob Barton and Keith Haynes completed the Kent Golden Mile on Sunday. Green finished in 5m:14s, Barton in 5m:27s and Haynes in 5m:54s. Green and Barton both took on the 5k event also and finished in 18m:20s and 19:35s respectively.